The New Harmony Inn in Indiana can provide custom catering for your special event – from business meetings and corporate retreats to weddings and family reunions. Any group of 20 or more people can take advantage of our professional catering services. The catering staff of the New Harmony Inn Conference Center offers a range of services to accommodate a variety of tastes and themes. 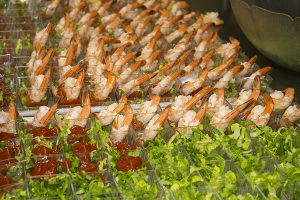 From box lunches to elaborate wedding receptions, we focus on the finest detail to ensure every guest is satisfied. From tent cards to tents, our event professionals will assist in the planning and procurement of every aspect of your gathering. An experienced meeting planner will be assigned to your project to ensure a successful event. While we have large rooms at our Conference Center available for any function. Please call our Sales department at 800-782-8605 option 4 for facility availability and additional information. Our catering services can be any style you desire: a sit-down meal, buffet, picnic or just a reception with hors d’oeuvres. We’ll help create a custom menu to meet your needs. We offer an extensive array of catered food. View our Catering Menu.